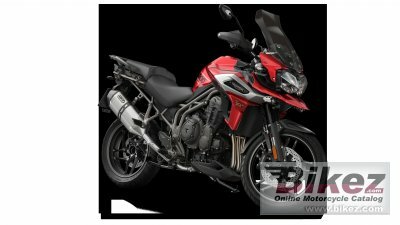 2018 Triumph Tiger 1200 XRT. Picture credits - Triumph. Submit more pictures. This is a motorcycle that�s packed with more power, advanced ergonomics and the absolute highest level of state-of-the-art technology ever on a Tiger XR, all to deliver the ultimate road-focused adventure. Price as new (MSRP): US$ 21050. Prices depend on country, taxes, accessories, etc. Seat height: 837 mm (33.0 inches) If adjustable, lowest setting. Alternate seat height: 857 mm (33.7 inches) If adjustable, highest setting. Comments: Windscreen. Auxiliary lights. Engine protection bars. Cruise Control. Hand Guards. Heated Grips. Inertial Measurement Unit (IMU). Electrically adjustable Touring screen. Ask questions Join the 18 Triumph Tiger 1200 XRT discussion group or the general Triumph discussion group. Bikez has discussion forums for every bike. View comments, questions and answers at the 2018 Triumph Tiger 1200 XRT discussion group. You can sign up for e-mail notifications when other riders answer you. If you have extensive experience with the MC, please send us a review. If you consider buying this bike, you should view the list of related motorbikes Look at photos. Compare technical specs. And check out the rating of the bike's engine performance, reliability, repair costs, etc. You can compare the rating with other bikes.